Supermarket grocery catalogues like Iga, Aldi grocery products. These product ranges consist of top quality fresh meat, fresh food products and you can shop weekly for the reduced prices. Also special buys of Aldi will be very beneficiary for your budget. Online grocery shopping can be advantage to feel free to pick the organic food, healthy offers. You can see them comfortable before you go shopping. Grocery catalogues are featured by many stores on this page. Special offer by Coles on pg 5 is Monster original energy drink pack of 4. Half price is featured on this product this week. Don't miss this deal out ! For more products please visit preview page. Other catalogues like ALDI, Woolworths and IGA Catalogues are also available in the main page. Check out details of half price products of Coles Catalogue you can see with your browser. From candy varieties to deli products there are plenty of half price products at Coles. The whole product range on pg 3 are half price products. These are chocolates, candies, snacks and appetizers. Coles Catalogues offer you one of the best product selections of supermarket food. Every week you can shop this type of products for half prices. Woolworths and ALDI have got also grocery products. Today IGA must have a new catalogue as well. New values of the products are featured on this catalogue can also be categorized as half price products. Extreme savings for the top quality food products of the retailer are all viewable on the catalogue page. Preview of this simple catalogue allows you to browse quick and simple display. Woolworths half price products are picked from every aisles. These included detergents, household cleaning products, bathroom products, similar sort of things to keep your house tidy, clean and comfortable to rest. Moreover see new deal by Woolworths Catalogue. Ancient Animals packs, deals, collector's album are the deals of the week. I recommend you all to seek savings in any catalogue because the most important part of online shopping is saving. Otherwise it would be meaningless beacuse of the same prices were present in the supermarket. Woolworths and Coles are 2 very popular and must-know supermarkets for snacks, packaged simple meals and similar sort of things. Check out new seafood range of Woolworths Catalogue on pg 5. Extra Large Cooked Aussie prawns and king prawns are on sale this week. Moreover packaged food products can be seen on this section. Savings of seafood section of the Woolworths worths around $25. Grocery section of Woolworths is full of savings. You can save up to $2 with mushroom and olive oil purchases on pg 8&9. Classic grocery products for extraordinarily low prices. Organic kiwi, oats, orange, premium beef mince, almond milk and similar sort of food are featured on the PG 10&11. Check out all details of the Woolworths Catalogue for these products and savings. Don't forget that you may complete extra needs if you know enough about the savings like catalogues. 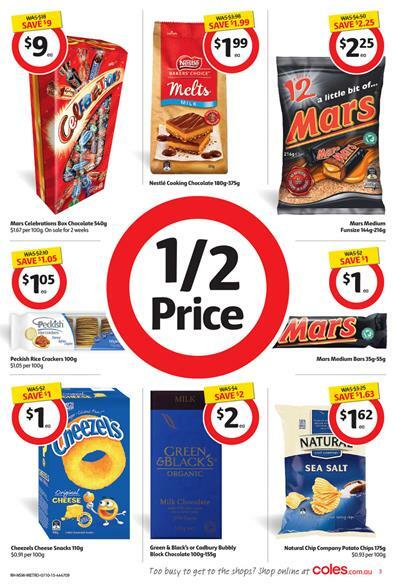 You can't miss these beautiful selection of Coles Catalogue and these prices are just perfect you love saving when you are purchasing your favourite snacks. 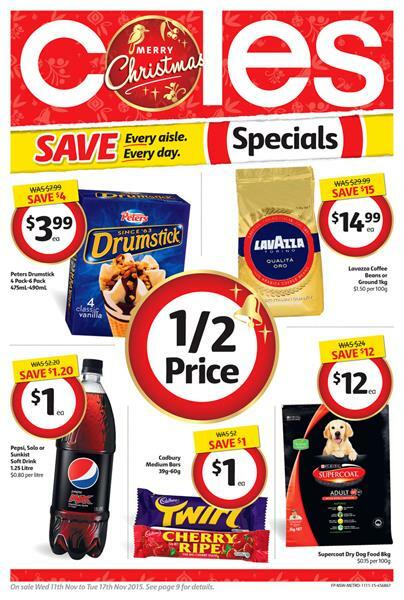 Crackers, Cadbury chocolates, the best candies of Australia and of course coke, Schweppes, Powerade, V8 juice, Red Bull plus half price products are heavily highlighted products of the latest Coles Catalogue selection. You can easily find these viewable on the display browser which is directed with the link attached to the image of the catalogue pages. Additionally this catalogue can match the needs of food for fun in the night while your favourite show is on stage. No concerns for expensiveness than we can talk about happiness and satisfaction in shopping especially when online. Coles and similar stores like Woolworths provide such advantage for all customers and you all can browse their online catalogues on our page.